Celebrating the legacy of the Reverend Doctor Martin Luther King? Chances are you'll attract a crowd of like-minded supporters, and when you've gathered that many participants, it's only right to offer them a refreshment. 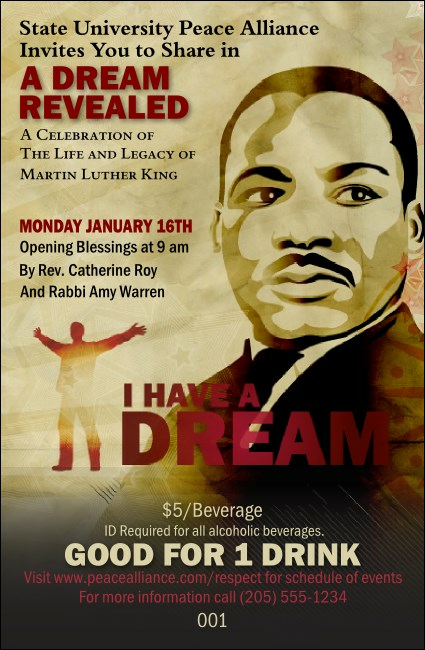 Why not use the Martin Luther King Drink Ticket to serve beverages at your event? Fill in the easy template below to get started. TicketPrinting.com offers Event Kits for the whole year.